If you’re looking for regular analytics for regular company pages that you can do all by your lonesome self, the recently expanded Facebook Page Insights feature provides valuable, free, content-focused metrics. 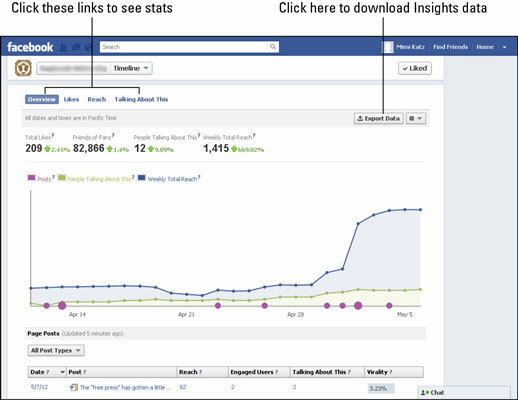 Your Page must have 30 Likes before you can access Insights. By analyzing user growth, demographics, and engagement with content, you can better focus on content that helps you hold onto your audience and that encourages them to share your material with their friends. Gathering data for data’s sake doesn’t make sense. You need to take advantage of the data to modify your content stream. The principle is the same as with all marketing: If it works, keep doing it; if it doesn’t work, stop. As usual, Facebook provides multiple — and sometimes confusing — ways to accomplish a task. In this case, you have three options. Log in as administrator for your Page. In the left navigation, select the page you want to review (under Pages). The resulting Administration Panel for that page includes a snapshot of Insights. For more details, choose See All on the Insight Preview Box. After logging in as administrator, type www.facebook.com/insights into the address bar of your browser and navigate to the page you want using the Select Insights drop-down menu located in the upper-left corner of the page. You’ll reach the same Insights Dashboard Overview display. Choose View Insights on the menu that appears below the cover photo on your Page. Again, it will take you to the same display. All three methods take you to the same dashboard screen. A breakdown of activity over a one-month period: Between the Overview page and the Likes page, you can see how many new Likes you have and how many people have Unliked your page. The number of interactions per post, the breakdown of active fans, and much more: To analyze a specific metric, select an option from the top navigation and scroll down. A spike in the number of new Likes: When you see this type of improvement, note the type of activity you posted on your Page that day. For more specific information, review the number of new Likes (or Unlikes) over a month span on the Likes tab. Then compare the post(s) for the specific date you saw a change on the Overview page. For more information, check the Insight section on Seodigerati.com or go to Facebook’s help page.